The constituency office of Minister of Transport Noel Dempsey in Trim, Co Meath, was attacked overnight. 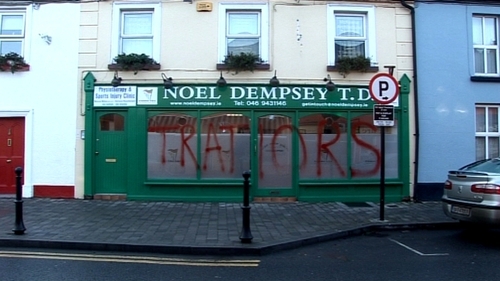 A number of windows in Minister Dempsey's office were smashed and the word 'tratiors' [sic] was written across the front of the office. A spokesperson for the minister has described the attack as 'an act of mindless vandalism'. Garda technical experts conducted an examination of the scene.